For the Splatfest from Splatoon, see Boke vs. Tsukkomi (Splatoon). Boke vs. Tsukkomi was a Splatfest event in Splatoon 2. It was held in Japan only. It took place from 2 February 2019 to 3 February 2019. It was announced in the February 2019 issue of CoroCoro magazine, released on 15 January 2019 and on 25 January 2019 at 08:00 UTC in-game. The results were given on 3 February 2019. The Splatfest repeated the topic of the Splatoon Splatfest of the same title. "Boke" and "Tsukkomi" are typical archetype comic duo, equivalent, respectively to "Fool and Straight Man" acts in the west or "Punch and Judy" puppet shows. The Tsukkomi will often reprimand the Boke for his silliness by striking him with an oversized paper fan, which provides a loud and comical sound effect. The Shifty Station layout that was featured in this Splatfest was layout 19, "Quick". 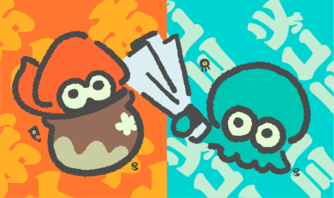 The panel image for this Splatfest is almost identical to its original iteration, with the only differences being that the Boke mascot is in a pot instead of a clamshell, and the second is that the Tsukkomi mascot is an octopus instead of a squid, representing Marina instead of Marie. The announcement in the magazines themselves had the Splatfest as starting Sunday, February 3, 2019. This was an error, as the CoroCoro website and the game itself listed the Splatfest as starting on Saturday the 2nd instead. The Splatfest team icons are unusually not the mascots, rather, they are stylized Japanese text representing the two team names in katakana: ボケ and ツッコミ respectively, with the "ke" kana for Boke rotated counter-clockwise and written to resemble the romaji "K", and the "ko" and "mi" kana in Tsukkomi rotated 90 degrees clockwise. The promotional artwork for the Splatfest features characters from the Splatoon manga, specifically: Goggles, Bobble, Specs, Headphones, Skull, Gloves, Prince, and Hachi. Chapter 31 of the Splatoon manga even features this Splatfest, with Goggles, Bobble, Gloves and Hachi on Team Boke and Specs, Headphones, Prince and Skull on Team Tsukkomi. This page was last edited on 5 April 2019, at 01:21.